The 2014 Dodge Dart has been named a “Best Bet” in the compact car category of this year’s edition of The Car Book. It is the second consecutive year the Dart has been so honored. The recognition is based on an analysis of wide-ranging information collected from government and independent sources. The analysis is conducted by The Car Book and the Center for Auto Safety considers crash test results, safety features, rollover rating, preventative maintenance schedules, repair costs, warranty coverage, fuel economy, complaint data and insurance costs. The 2014 Dodge Dart scored “9” for having low repair costs, and “8” in the key categories of warranty coverage, rollover rating, fuel economy and crash tests. The 2014 Dart recently was named a Top Safety Pick by the Insurance Institute for Highway Safety. The car also boasts a 5 star rating the highest possible assessment in the National Highway Traffic Safety Administration’s crash testing program. The Dodge Dart also tops the compact car segment in total quality, according to Strategic Vision Total Quality Index. The Dart’s performance is enhanced by more than 60 available safety and security features. The list includes 10 standard equipment air bags, a total unsurpassed in the compact car segment. The 2014 Dodge Dart further benefits from a high strength steel content ratio of 68 percent, one of the highest in the industry. Equipped with a 1.4 liter turbocharged, intercooled I4 engine with MultiAir electro hydraulic valve actuation and six-speed manual transmission, the Dart also earns a highway fuel-economy rating of 41 miles per gallon (mpg). Being named a “Best Bet” in The Car Book is the latest accolade bestowed on the Dodge Dart. Its celebrated Uconnect hands free navigation and communication technology earned 2014 Connected Car of the Year honors from Connected World Magazine. The award was given in the small car category. The Dodge Dart is considered a small car, but its total interior volume of 97.2 cu. ft. (2.75 cu m) rivals that of midsize cars, according to U.S. Environmental Protection Agency classifications. Strategic Vision also recently listed the 2014 Dart among its “Most Loved Vehicles in America.” Ratings are based on calculations that consider vehicle attributes and performance, and customer attitude. 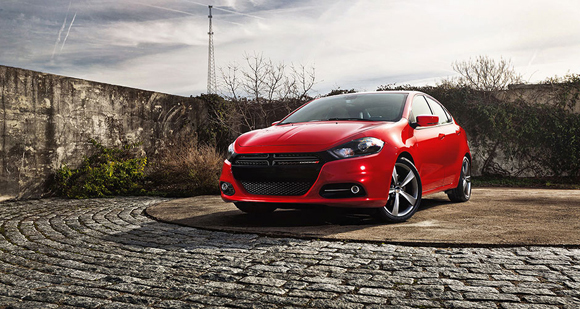 The 2014 Dodge Dart redefines performance with an agile, fun to drive experience, compliments of its Alfa Romeo roots. It’s crafted with high-quality materials and loaded with state of the art technology and class leading safety features. The new Dart GT model builds on that foundation and offers attributes compact car buyers appreciate, such as a 2.4 liter engine with 184 horsepower, a sport-tuned suspension, available hyper black 18 inch aluminum wheels, along with class-exclusive features like an 8.4 inch Uconnect touchscreen media center and LED racetrack taillamps. The Dart provides drivers with the ultimate combination of power, efficiency, technology and style.